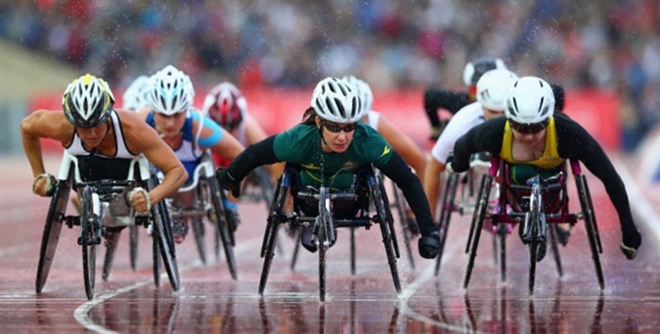 Women’s T54 Wheelchair 1500m para-athlete Angela Ballard (NSW) has defied atrocious conditions on a rainy evening at Hampden Park in Glasgow (SCO) to win Australia’s fourth athletics gold medal at the Commonwealth Games, while Kurt Fearnley (NSW) has added a silver in the men’s T54 1500m event on Day Five of competition. In heavy rain not conducive to wheelchair racing, Ballard surged past a tiring Diane Roy of Canada on the home straight to break the line and add Commonwealth gold to her three IPC World Championship titles. Ballard clocked 3:59.20 to finish ahead of the Canadian in 3:59.55. “It worked out perfectly for me,” said Ballard. “Midway through the race I was boxed in and I didn’t think that was a great part of the plan. I didn’t intend that to happen, but because of the wet weather and the varying degrees which people push well, it worked for me because it spread the field out and I was no longer boxed and was able to come around. Ballard said the wet conditions played a huge part in the race and influenced her preparation for it. Christie Dawes (NSW) was also in the women’s T54 wheelchair final and she clocked 4:03.43 as she finished in fourth place. The excitement of Ballard’s win had barely settled down when Fearnley took to the track in the men’s T54 1500m final. Fearnley led early before his rival David Weir of England moved past him on the final lap in the back straight. Fearnley tried desperately to go with Weir but he couldn’t bridge the gap and the Englishman took the gold in 3:21.67 with Fearnley taking silver in 3:23.08. Fearnley said afterwards it had been an emotional race for him. Fellow Australian wheelchair racer Richard Colman (Vic) finished in fourth place in the T54 men’s 1500m final in the time of 3:24.37, while Richard Nicholson (ACT) came seventh in 3:32.11. Thrower Benn Harradine (Qld) has finished just outside the medals, placing fourth in the men’s Discus Throw Final. As competitors struggled to come to terms with the slippery conditions in the circle, Harradine had a best throw of 61.91m to finish just 43cm behind bronze medallist Jason Morgan of Jamaica, who threw 62.34m. Harradine, the Australian men’s discus throw record holder, ensured a top-eight finish and that he would have the maximum six throws when his first attempt reached 59.81m. That was good enough to rank him fifth after three rounds and he then improved to 60.33m in Round Four as the rain started to pour down. He fouled his fifth attempt before hurling the platter 61.91m on his final throw in a desperate attempt to get into the medals. It moved him into fourth but ultimately Harradine couldn’t overtake the Jamaican. The event was won by Vikas Shive Gowda of India with a distance of 63.64m. Australia’s other competitor in the men’s discus final, Julian Wruck (Qld), managed a best throw of 58.37m in Round Three but it wasn’t enough for the top eight placing he required to earn another three throws and he finished in ninth place. Middle distance runner Jeff Riseley (Vic) was a late addition to the men’s 800m final but he made the most of his opportunity to come tantalisingly close to grabbing a medal in one of the best events of the night. Riseley made a strong surge down the home straight to be in bronze medal position with 60 metres to run. Whilst he ultimately finished in fifth place in 1:46.12, he was just 0.08 seconds behind the bronze medallist, Andre Olivier of South Africa (1:46.03). The race for the gold medal was a battle to the line between David Rudisha (KEN) and Nijel Amos (BOT) with the Botswanan delivering the upset of the meet to win in 1:45.18. “I was just trying to get my body over the line and practicing my sprinter dip,” Riseley said of the exciting finish. “It’s bittersweet, being so close, but it’s also kind of disappointing obviously. Lauren Wells (ACT) represented Australia in the women’s 400m Hurdles Final and was also close to winning a medal, coming in fourth in 56.09. In the Women’s 200m Ella Nelson (NSW) came sixth in her Semi-Final in 23.50 (wind -1.1) behind 100m champion Blessing Okagbare of Nigeria in 22.43. Ash Whittaker (Vic) later ran 24.49 (wind +0.4) in her Semi-Final but neither Australian could advance to the Final, which was won by Okagbare in 22.25 (+0.4). Brittany McGowan (Qld) ran courageously in her 800m women’s Semi-Final and put herself in a position to challenge with one lap to go but tired to finish eighth in 2:08.79. In the women’s Discus Throw Qualifying, all three Australians have advanced to the final. Former World Champion Dani Samuels (NSW) cruised through qualifying, needing just one throw to beat the automatic advancement mark of 57.00m. Samuels threw her one attempt almost six metres further than any other competitor, reaching 64.53m. Taryn Gollshewsky (Qld) set a new personal best of 58.24m to reach the automatic qualification standard as well, one of just five athletes to do so. She finished the qualifying round ranked third. Christie Chamberlain (NSW) also advanced to tomorrow’s final, with her best throw of 52.46m ranking her 10th. London OIympic champion and Australian athletics team captain Sally Pearson (Qld) put a tumultuous week behind her to register her fastest time since arriving in Europe in winning her heat of the women’s 100m hurdles. Pearson was almost a full flight clear of her nearest competitor, and clocked the fastest time of any of the heats. She was a full 0.15 faster than the woman most expect to be her main challenger, Tiffany Porter of England who ran 12.84 (+0.7). “I was really nervous out there,” Pearson said. “I treated it like a final because for me it is just another race. Pearson’s teammates Shannon McCann (WA) and Michelle Jenneke (NSW) have also both advanced to Friday’s final. McCann finished second in her heat in the time of 13.34 (-0.4) to earn an automatic berth in the final, while Jenneke finished in fourth place in her heat but advanced on her time of 13.33 (+0.7). Events on day six, together with competing athletes are listed below. The session start time is listed in Australian Eastern Standard Time and events in the order of occurrence.